The BEA released the underlying details today for the Q1 Advance GDP report. As expected, key non-residential categories - offices, malls and lodging - saw further declines in investment in Q1. Note: Last year, there was a small overall increase in non-residential structure investment due to investment for power and communication, and mining and exploration of petroleum. 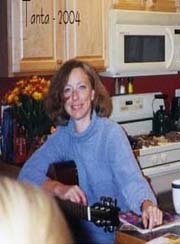 This masked some of the decline in other categories. 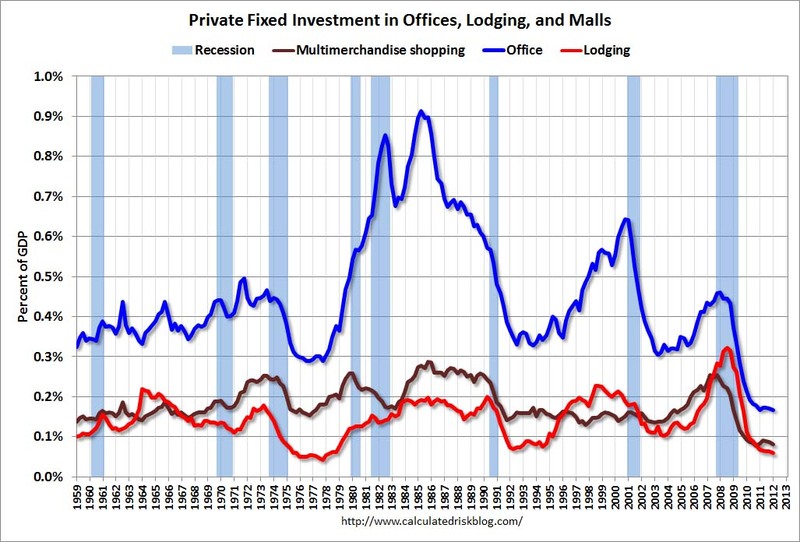 The first graph shows investment in offices, malls and lodging as a percent of GDP. Office investment as a percent of GDP peaked at 0.46% in Q1 2008 and then declined sharply. Investment as a percent of GDP fell to a new low in Q1 and is now down 64% from the peak. This decline will probably slow mid-year based on the architectural billings index, but with the high office vacancy rate, investment will probably not increase (as a percent of GDP) for several years. Investment in multimerchandise shopping structures (malls) peaked in 2007 and is down about 68% from the peak and at a new low in Q1 (note that investment includes remodels, so this will not fall to zero). Lodging investment peaked at 0.32% of GDP in Q2 2008 and has fallen by about 82%. Investment in single family structures is finally increasing after mostly moving sideways for almost three years (the increase in 2009-2010 was related to the housing tax credit). Investment in home improvement was at a $164 billion Seasonally Adjusted Annual Rate (SAAR) in Q1 (over 1.0% of GDP), significantly above the level of investment in single family structures of $114 billion (SAAR) (or 0.74% of GDP). 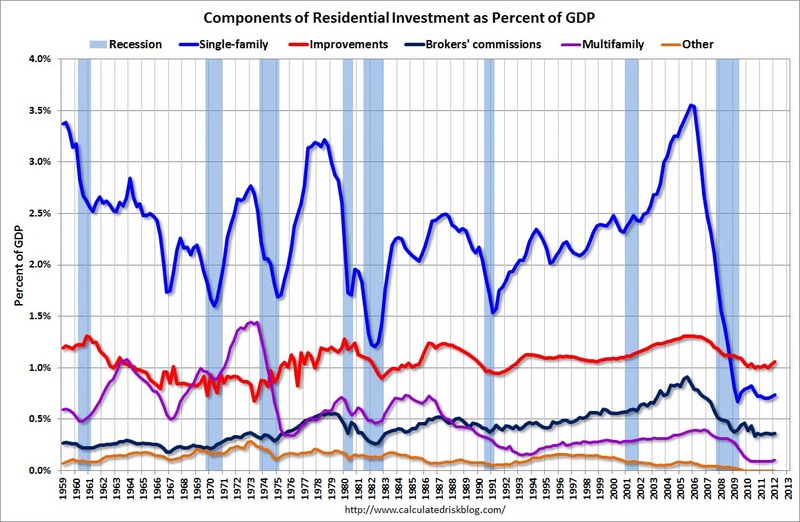 Eventually single family structure investment will overtake home improvement as the largest category of residential investment. Brokers' commissions increased slightly in Q1, and has been moving sideways as a percent of GDP. 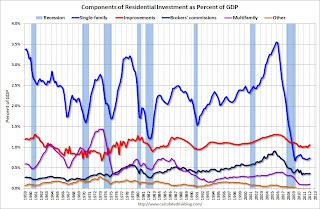 And investment in multifamily structures increased slightly as a percent of GDP. This is a small category, and even though investment is increasing, the positive impact on GDP will be relatively small. 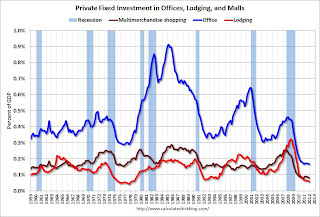 These graphs show there is currently very little investment in offices, malls and lodging. And residential investment is starting to pickup, but from a very low level.